The Daily Prompt: Snapshot Stories — Open the first photo album you can find — real or virtual, your call — and stop at the first picture of yourself you see there. Tell us the story of that photo. Okay, you asked for it. Well, maybe you didn’t really ask for it. But I’m going to give it to you. 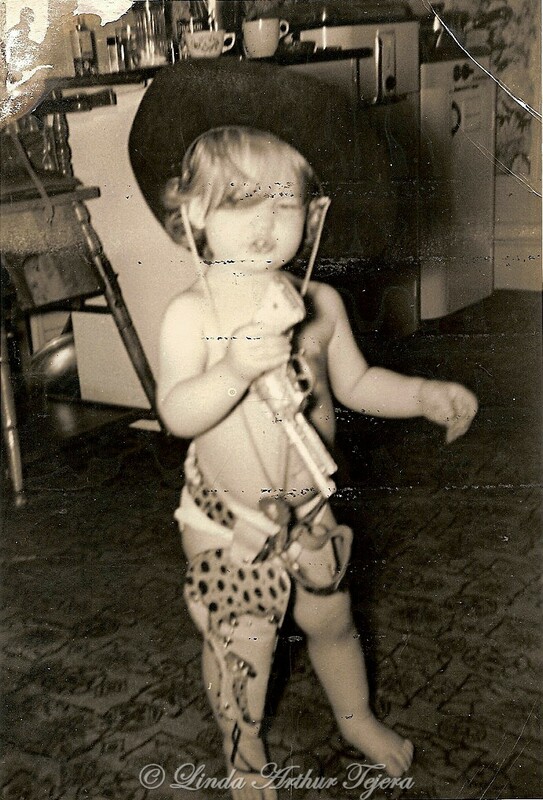 First album, first photo of me that I find. I must admit I ran across quite a few early photos. But what can I say about this one? Really, all I can tell you about this photo is that it is of me. I can’t tell you how old I was (guessing somewhere around two maybe?). We were in Columbus, Ohio but I’m not sure if we were living at the Jefferson Hotel (father was manager) at the time of this picture. 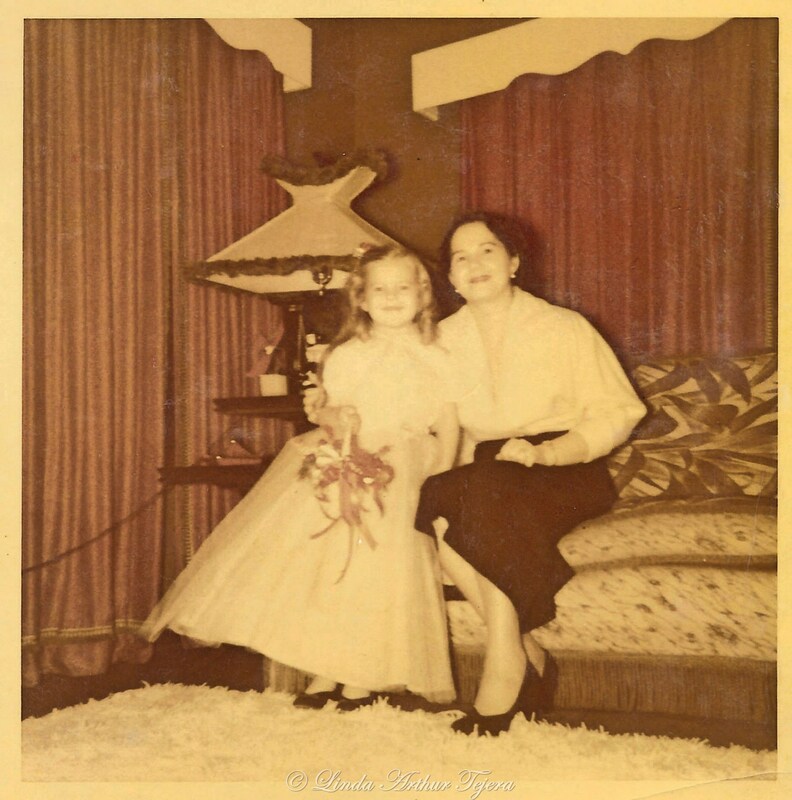 As you can see, I don’t know anything about photo restoration and this one is in very poor condition. I grew up loving mysteries, and like many young girls during the 1950s and 1960s, I voraciously read (and vicariously lived) as Nancy Drew. When I was older, I worked with the police department from 1974-75 as a patrol officer. But reality set in and I realized I didn’t want to be the one GOING TO a shooting in progress. So my working life was spent working with attorneys safely tucked behind a typewriter/computer. 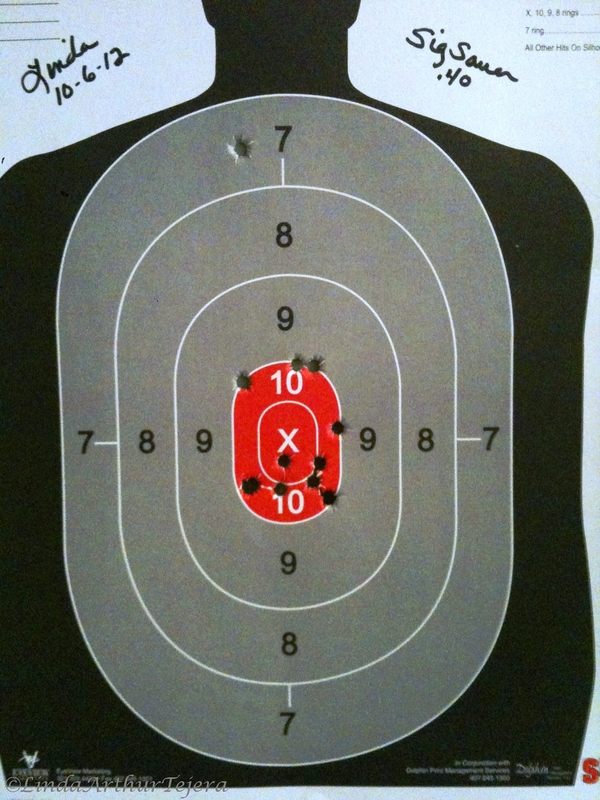 But I never lost my love of a good mystery and I still love good old target shooting! And I must say, I’m pretty good at it even if I do say so myself! What sort of music was played in your house when you were growing up? What effect, (if any) did it have on your musical tastes? Okay, if you’re through laughing, you can pick yourself up off the floor. Sheesh, I was only about six years old. Obviously, they were my formative years because the words and music stayed with me! Of course, it wasn’t long after that (probably somewhere around 1957-1958) my best friend and I taught ourselves how to jitterbug to some of these 1950s hits by watching American Bandstand! Yes, I really do like a lot of the 50s music. But the truth of the matter is that I have always liked and will always prefer the sounds of the 1960s and 1970s. And that’s just the way it is — I mean the way I am! I’m not about to start listing all my favorites from my teen years. We’d be here all week! 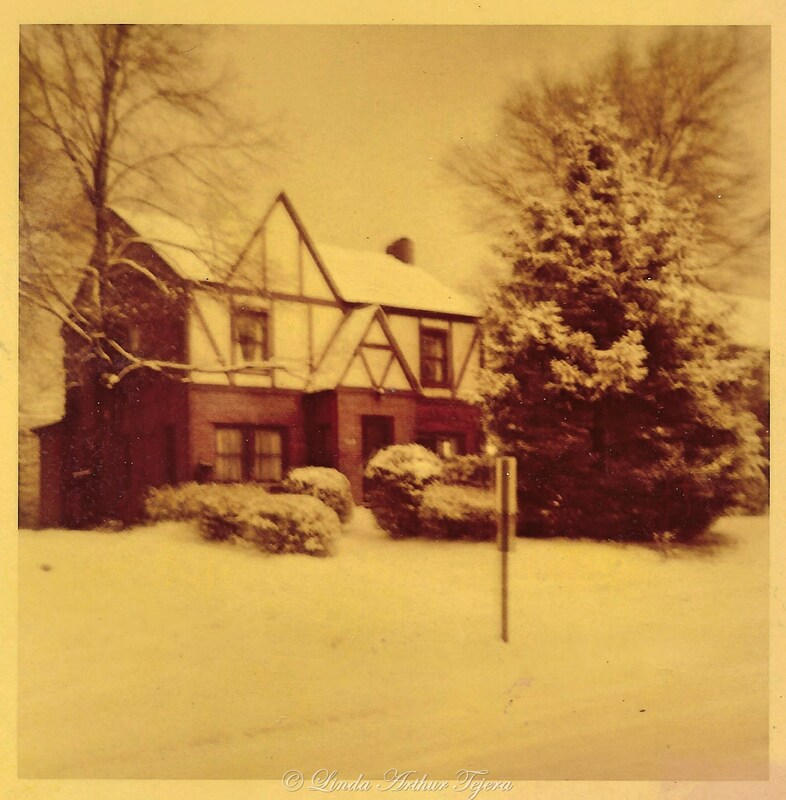 What are the earliest memories of the place you lived in as a child? Describe your house. What did it look like? How did it smell? What did it sound like? Was it quiet like a library, or full of the noise of life? Tell us all about it, in as much detail as you can recall. I lived in this English Tudor from about 3 until I was 6. That house has, I believe, formed my entire taste in homes and furnishing styles. Course, I guess they do say those are the “formative” years!! I still have so many memories from those few years in that house. I remember Dad’s strawberry patch in the back yard. I can still remember him complaining about the birds getting his strawberries. So, he took some chicken wire and made a frame to cover the patch. He said it worked perfectly to keep the birds out; if he could only find something to keep the little fingers out! There was Mom’s flower garden and rose bushes. She had every color rose and tulip and I can still smell that beautiful strong floral scent. I don’t know all the different kinds of flowers she had. But I remember the beauty. I’m just sad that I have no pictures. I have great memories of that backyard. That’s where my mother would sunbathe on her quilt while teaching me the alphabet and to count to 100. I remember my Dad stopping the car at the end of the driveway when he was getting home from work, putting me on his lap and letting me “drive” the car up the driveway! This is Mom and me in the living room. I’m all dressed up because I was a flower girl in a wedding. I have no clue whose wedding! Our house backed up to the high school football stadium. My Dad and brother would go up on top of the garage after each high school football game to gather up the lost items/money from the overzealous patrons! Having the stadium there also gave us the PERFECT view of the fireworks each 4th of July. I remember picking and eating the wild rhubard that grew behind the neighbor’s garage; climbing trees — including the neighbor’s cherry tree and eating the good ones at the top; learning to ride my bike; my best friend Dodi. As a side note, after 60 years, I have reconnected with Dodi via Facebook and email! Amazing. One time when my aunt (my mom’s twin sister) was visiting, she and the rest of the family were outside. I was probably no older than four. I went up to the attic, which had been converted into my brother’s private sanctuary (he’s 11 years older than me), where I had no business. But, for whatever reason, I decided to look out the open, screened window at everyone. Lo and behold, next thing I know is that the screen starts to fall. Well, since I didn’t want to get into trouble, I held onto that screen while hanging half in and half out of the window. I remember screaming my head off. Next thing, my aunt just happens to hear/see me and she starts screaming and running. Needless to say, they got to me in time! So much hugs and yelling. Imagine nearly falling out of the third floor attic window because I wouldn’t let go of the screen when it fell out. You can almost make out the window at the very top on the side of the house. I had my Boston Terrier, Happy, then. My constant and faithful companion. Bostons do have bull dog traits — no wait, that’s bull headed traits! I was upstairs on the second floor getting ready to take Happy for a walk in the neighborhood. He had his leash on him and we started down the stairs. We were about halfway down the stairs and something excited him. He took off and dragged me down the remainder of the stairs. At least they were carpeted and I was just scared and not hurt. My dad caught me at the bottom and tried to console me by telling me I should have just let go of the leash. Hmm, I see a pattern developing. I remember the playroom off my bedroom entered through my closet; my Mom decorating my bedroom in pink and white, stenciling and handpainting a big “L” on my bed’s footboard. So many more memories of that time and place. But please don’t ask me what all I did yesterday! I can’t remember! 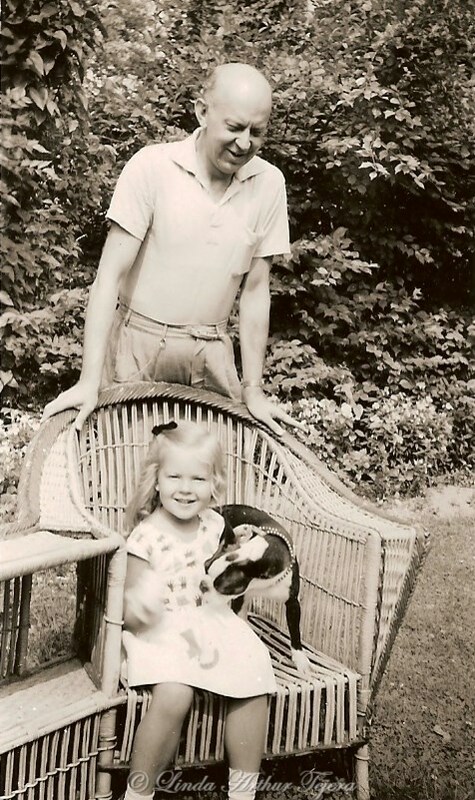 I remember one summer back in the 50s, I guess I was probably about eight to ten years old, and my parents took me from Ohio to Kentucky to spend some summer time with my cousin, Carol Sue. She was a year younger than me and we were like sisters. That summer we did everything together. Carol Sue was going to get to go to a beauty parlor (they were called parlors back then!) and get her hair cut. I really wanted to go, too. So, my aunt had me write my Mom and Dad and ask if I could have $5 to go with Carol Sue and get a haircut. When the money arrived, off we went to get our haircuts. We went by ourselves because the shopping center was within walking distance. Carol Sue went first and when she was done I really liked her haircut. So, I jumped up into the chair and told the lady that I wanted the same haircut. She hemmed and hawed and talked to the other ladies in the shop. She kept asking me if I was sure it was okay with my mother if she cut my hair. “Of course,” I said, “She gave me the money to come here!” And she proceeded to give me a haircut. I loved it! A short time later, my parents came to pick me up. I remember standing in the living room with Carol Sue and my aunt. I was so excited to see them again even though I had had such a wonderful time at my cousin’s house. My mother was the first one through the front door closely followed by my father. As soon as she walked in, she took one look at me, screamed and fell back into my confused father’s arms. He took one look at me and he started yelling, “What did you do to your hair? Look what you’ve done to your mother! Your hair….! Your mother…. !” He stuttered those phrases about two or three times. I didn’t understand what the big deal was. That was about the time they began “yelling” (my parents never really yelled, they just voiced disapproval) at my aunt. Well, the big deal was that my mother loved my hair. I suppose my dad did too. It went all the way down my back to just below my waist and it was thick and wavy. My mother recovered. She said that when she sent me the money to go with Carol Sue to get a haircut, she thought I was just going to get a trim. My aunt started in on how she hated long hair on an active child. It was impossible to untangle and it would grow back. My aunt survived. I had gone to the beauty parlor with waist-length hair and I came out with the style of the day – a pixie cut – one-inch all over! I don’t have any pictures of myself with it but here’s a Google image I found that would have been similar. Everyone survived! My folks took me home and my hair grew out again! You know, now that I think about it, I don’t think I ever got to spend the summer with Carol Sue again. Hmmmm…. Yep, pure and complete corn! But, what do you expect when you’re talking about a bunny that’s at least as old, if not older, than me? HA! That’s right. My little Pinky. We have a history together, Pinky and me, yes we do. 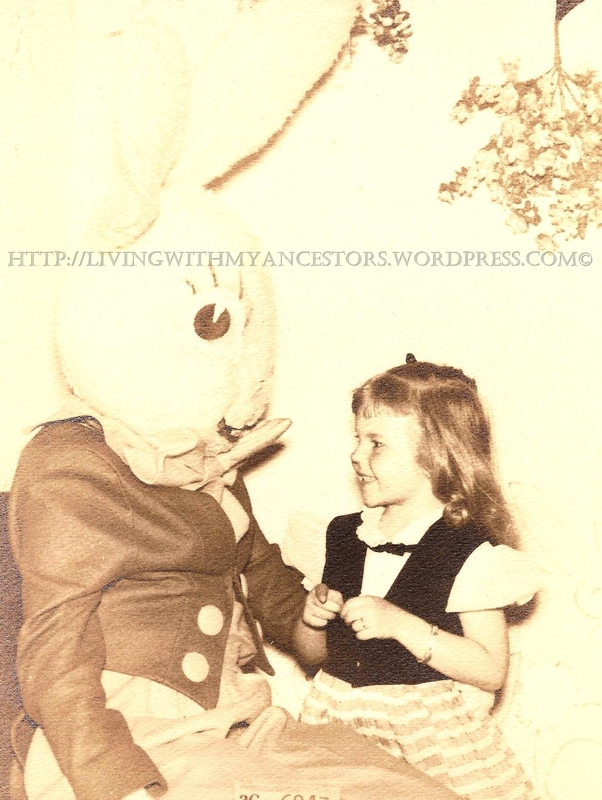 Why, I bet that bunny came into my life when I was about three months old. Do I dare say that I’m just weeks away from turning 65? Okay, I won’t say it. We’ve been through a lot together, Pinky and me. 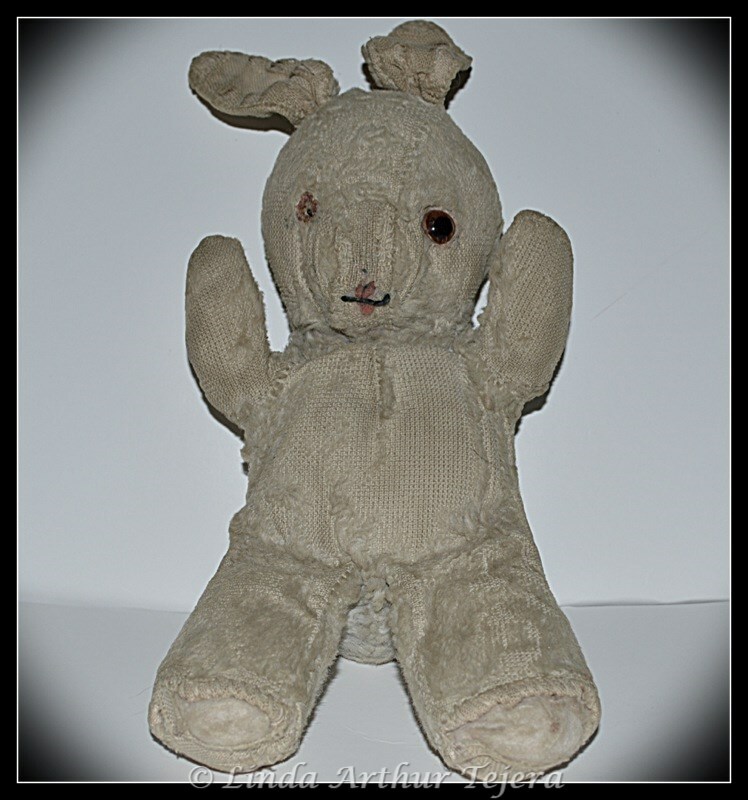 You can think all you want that I’m nuts but I’ve kept this little bunny with me my whole life. In my youngest years, Pinky was my “security blanket”. Unlike Linus, I found that it was much easier and more convenient to carry around Pinky rather than dragging some old blanket all over the place. I couldn’t go to sleep at night until I had Pinky safely tucked in, far away from any edges of the bed. Oh, my, we certainly wouldn’t want any part of him to extend over the edge of the bed and then suddenly be taken by those monster things that always lurked just out of sight under the bed. Why I’d sooner have hanged my own foot over the edge than any part of Pinky. Are you wondering what he looks like? Well, here’s a picture of him now. Turns out I don’t seem to have any pictures of him when we were young. I will say that we both definitely looked a lot better back then! He measures 9 1/2 inches from the top of his ear to the tip of his leg. So, you see, he would have been much more manageable than some old blanket. Ah, it brings to mind the words of that immortal poem by who knows who that goes, “Fuzzy Wuzzy was a bear (insert bunny even though it won’t rhyme! ), Fuzzy Wuzzy had no hair, Fuzzy Wuzzy wasn’t very fuzzy, was he?” Hoo boy, we really did say those things! Yep, when Pinky was younger, he was covered in a soft blue-grey fuzz. His ears, and the ends of his arms and legs were covered in a soft pink fabric. At one time he had two eyes! And, yes, the eyes were made of a hard plastic or glass, I can’t tell. And I didn’t swallow it! Now the fuzz is practically all gone. The funny thing is that it’s like it has disintegrated on its own because I don’t remember him being that bare when I put him away. I remember the first time I “lost” him. Or should I say, I remember the first time I remember I lost him. I was probably about three or four years old. One day he just seemed to vanish from the house. It didn’t make any sense to me. I cried for what seemed like at least three days. My parents turned the house upside down looking for him if for no other reason than to just shut me up! I knew I wouldn’t have lost him. Suddenly one day he just showed up. Truth? I think my older brother had hidden him from me. It’s one of those things you’ll never know. Anyone remember traveling before we had Interstates? Now, I’m really showing my age. Anyway, we used to travel between our little town in northwestern Ohio to visit my Mom’s family in Lexington, Kentucky. Two lane roads all the way. And my Dad was the type that (1) he always traveled at night because of less traffic and (2) he loved to stop at little diners at almost every little town to sit at the counter, have a cup of coffee and talk to the people. Well, on one of those trips, being a very sleepy child, I left Pinky at some diner. I have no idea how many miles we had driven before I started crying for my long lost friend. And wouldn’t you know, my Dad actually turned the car around and went back and retrieved my Pinky for me. I know that what he really wanted to do was to keep going on the road but he did that for me. I remember a time, oh, I was probably about eight years old. I decided on my own that Pinky needed a bath. I doubt he’s what you would term washable but I did it anyway. It probably would have worked out just fine but, kid that I was, I put him in a plastic bag with wooden colored pick-up sticks. My goodness, for a long time that bunny had so many different colors on him. But time has a way of taking care of just about everything! Well, enough reminiscences. These things only came to my mind because I was going through some things and “found” Pinky again. It’s funny the things we attach ourselves to. Anyway, I hope I haven’t completely bored you! 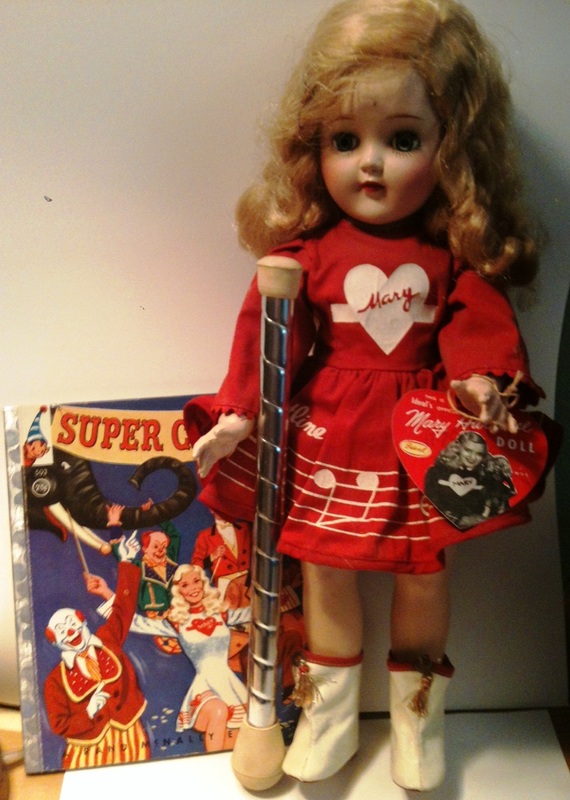 DOES anyone else remember Mary Hartline from the 1950’s television show Super Circus? Well, I do. Except that when I was a kid, I always thought it was called The Mary Hartline Show! 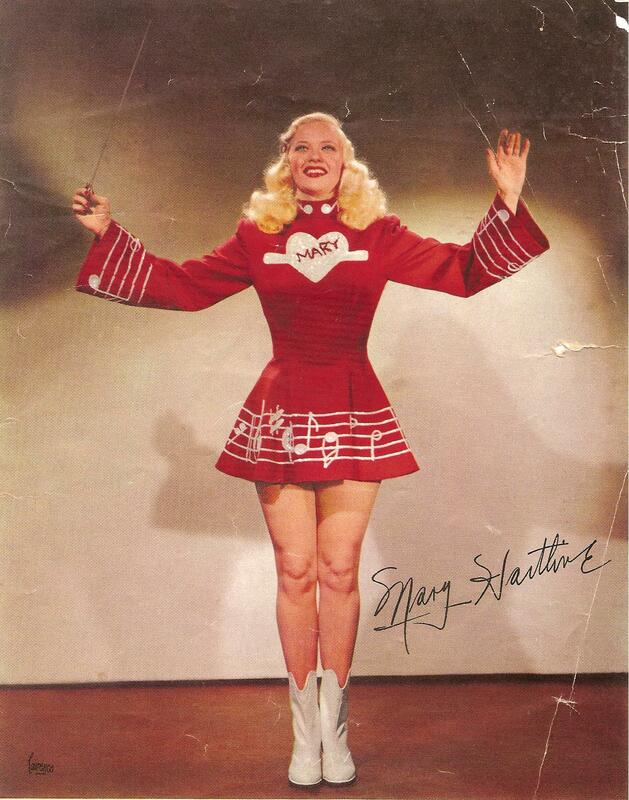 If you want more information about her and/or her show, just Google “Mary Hartline”. I liked everything about her – her beautiful long blonde hair, her costume, her boots, and her baton. 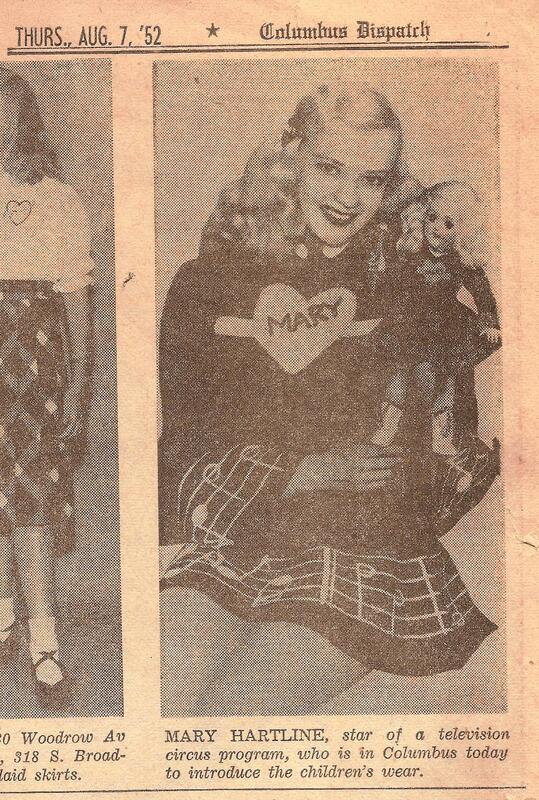 As a child, I was the proud owner of a Mary Hartline doll, a Mary Hartline dress and her paper dolls. I do still have my doll. 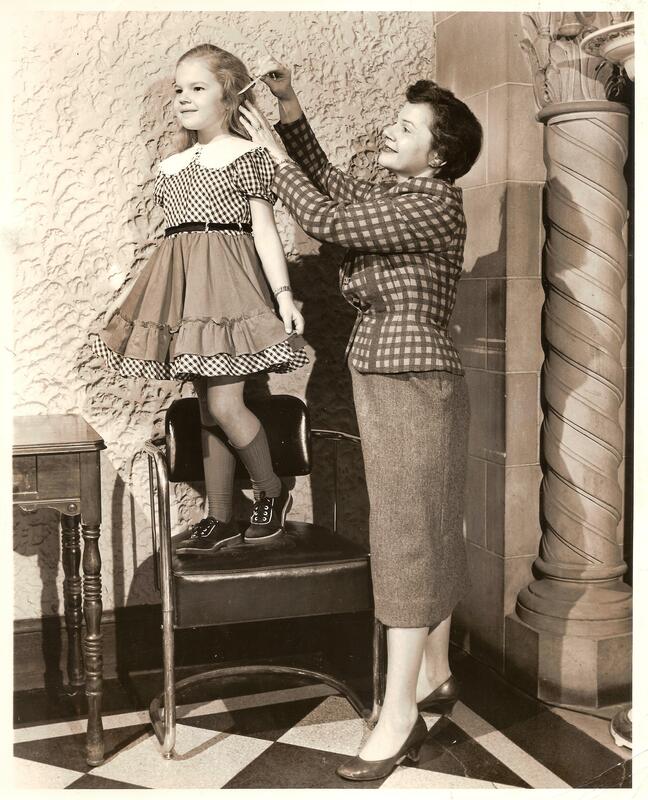 In the early 1950’s, I modeled children’s clothing for a number of the major department stores in Columbus (Lazarus, The Union, etc.). It was loads of fun. 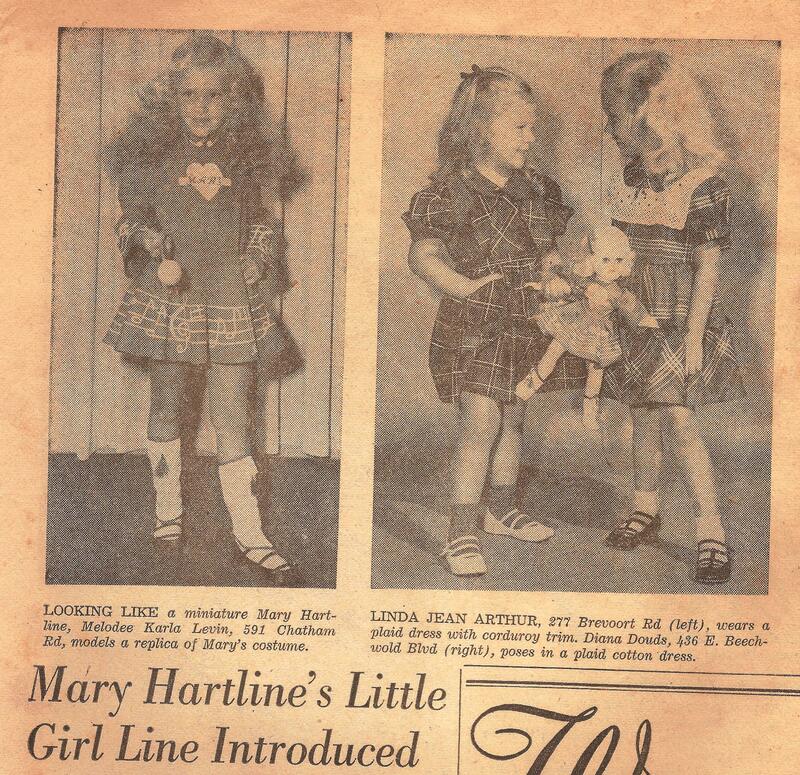 In 1952, Mary Hartline came to town to introduce her new line of girls’ clothing. I was lucky enough to be a part of it. Now if I could just actually remember the whole thing! If it wasn’t for having the pictures, it would have been a missing memory. Gosh, does anyone still put their children through this ? I look completely puzzled in this picture. I’m not so sure I was having such a great time! They did it again a few years later. At least I’m not afraid to look it in the face. I think I’m smiling. Of course my Mom probably convinced me it was just another photo shoot. I must have been given some candy or something. According to the University of Florida’s Center for Children’s Literature and Culture, the origin of the celebration — and the origin of the Easter Bunny — can be traced back to 13th-century, pre-Christian Germany, when people worshiped several gods and goddesses. The Teutonic deity Eostra was the goddess of spring and fertility, and feasts were held in her honor on the Vernal Equinox. Her symbol was the rabbit because of the animal’s high reproduction rate. 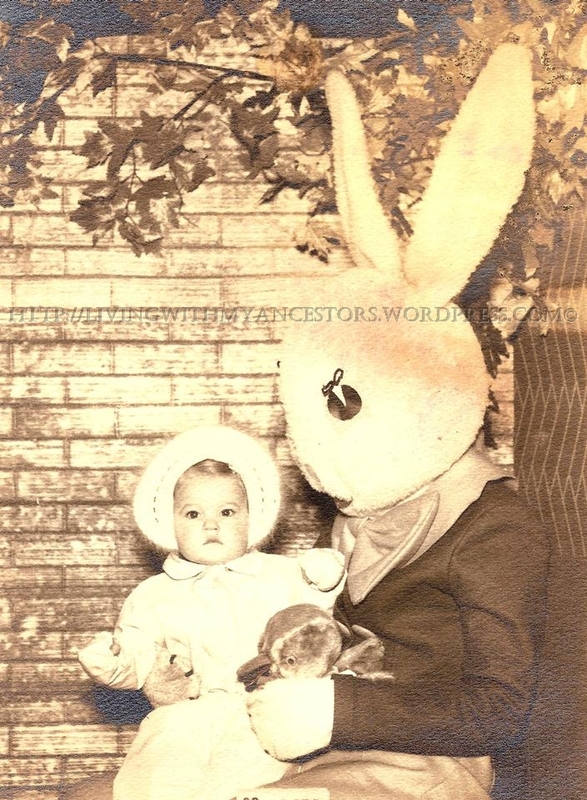 The first Easter Bunny legend was documented in the 1500s. By 1680, the first story about a rabbit laying eggs and hiding them in a garden was published. These legends were brought to the United States in the 1700s, when German immigrants settled in Pennsylvania Dutch country, according to the Center for Children’s Literature and Culture. 6 He is not here: for he is arisen, as he said. Come, see the place where the Lord lay. May you all have a blessed Easter.